Traditional bakers may associate sugar cookies with eggs, but it's surprisingly easy to find a recipe for eggless sugar cookies. When most people think about fitting cookies into a food plan, they think of fat, calories, or sugar. For vegetarians and vegans, there are different considerations. Not all of these recipes fit into every diet, but the following options prove that anyone can find a suitable recipe for eggless sugar cookies. In a large mixing bowl, cream the sugar, powdered sugar, oil, butter, and vanilla extract until smooth. Add the flour, baking soda, and cream of tartar, and mix well. Take small spoonfuls of dough and roll into balls. Place the balls on a cookie sheet, and press them to the size of nickels. In a mixing bowl, cream the butter and 1/2 cup sugar until light and fluffy. Add vanilla and milk, and combine. In a separate bowl, combine the single cup of flour with the salt and baking powder. Combine the wet and dry ingredients to make a slightly sticky dough. Once combined, add a small amount of flour, about 3 tablespoons, until the dough becomes less sticky. Pour approximately two tablespoons of sugar on a flat surface. Form the dough into 12 equal-sized balls, and flatten until approximately 1/2 inch thick. Press one side into the sugar to coat. Bake for eight to ten minutes, until bottom is golden brown. Once the wet ingredients are blended well, stir the wet ingredients into the dry ingredients, and mix well. When the dough is the right consistency, you should be able to form it into a large ball; if it is too dry, add a small amount of water. Shape the dough into small balls, and roll them in the cinnamon-sugar mixture. 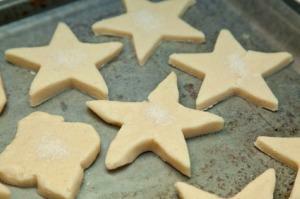 Place them on an ungreased cookie sheet and flatten slightly. Bake for seven to eight minutes. In a large bowl, cream the vegan margarine and sugar. Stir in the egg replacement and vanilla, and combine well. Gradually add the flour, baking powder, and tofu cream cheese. Form the completed dough into a log. Wrap in plastic wrap and place in the refrigerator to chill for approximately two hours or until ready to bake. Preheat oven to 350 degrees Fahrenheit, and remove dough from refrigerator. The cookies may be sliced from the chilled log. Or, roll the dough out on a lightly floured surface to 1/4-inch thickness, and use cookie cutters to cut the dough into the desired shapes. Place the cookies about one inch apart on lightly greased cookie sheets, and bake for 12 to 14 minutes until the edges are lightly browned. Remove from baking sheets and cool on wire racks. Ice if desired. In a medium bowl, combine the powdered sugar and vanilla soy milk until smooth. Add corn syrup and almond extract, and beat until the icing is smooth and glossy. If the icing seems too thick, add additional corn syrup to thin. Add food coloring, if desired. Dip cooled cookies and allow to dry overnight. Note: Unflavored soy milk can be substituted for vanilla soy milk, but it will change the flavor slightly, and the icing will be less sweet. Sift together the flour, baking soda, and salt in a medium bowl. In a large bowl, cream the 2/3 cup sugar, vegan margarine, and lemon zest until smooth and fluffy. Add tofu and whip again until well mixed. Fold in the dry ingredients and stir until well combined. Form dough into one-inch balls, and roll in the 1/4 cup sugar to coat. Flatten slightly, and bake on an ungreased cookie sheet for eight to ten minutes or until light golden brown. Making sugar cookies is a pleasure, so don't count them out just because eggs aren't in your diet. You can always search for eggless recipes or tweak traditional versions of the cookies to match up with ingredients you can eat. It's worth it to try a fresh, hot cookie straight from the oven!